This is an edited version of a post that originally appeared on a blog called The Michigan Telephone Blog, which in turn was reposted with the permission of the original author from a now-defunct Macintosh-oriented blog. It is reposted with his permission. This article was originally posted in January, 2009. One issue that some Mac “switchers” have encountered is that the colors on the Mac display look just a bit washed out compared to those on a PC. It’s generally not enough of a difference that anyone would complain; in fact, many new Mac users would think it was their imagination, or would attribute the difference to hardware variations (different display or graphics card). The gist of the problem is that Apple has chosen to, by default, go with a gamma setting of 1.8, whereas other systems use 2.2 as the default. 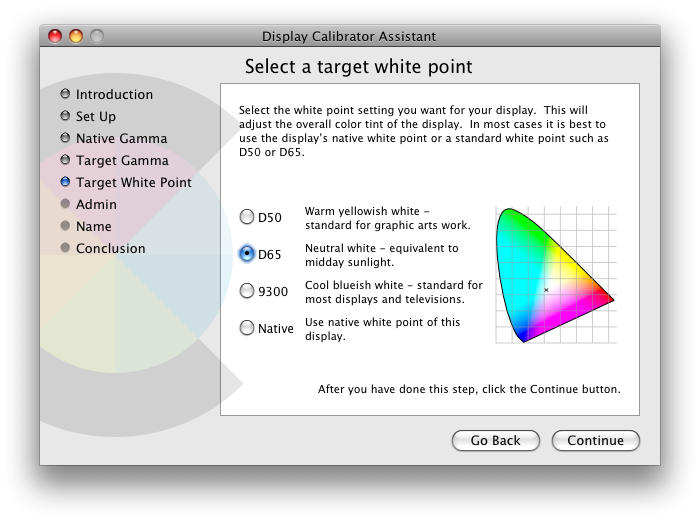 On the above-mentioned page, it gives this bit of wisdom: “Unless you have a color management expert instructing you otherwise, select a 2.2 gamma and a D65 white point.” However, the white point is not as important as the gamma, and you may wish to use the default white point that has been determined to be right for your display. 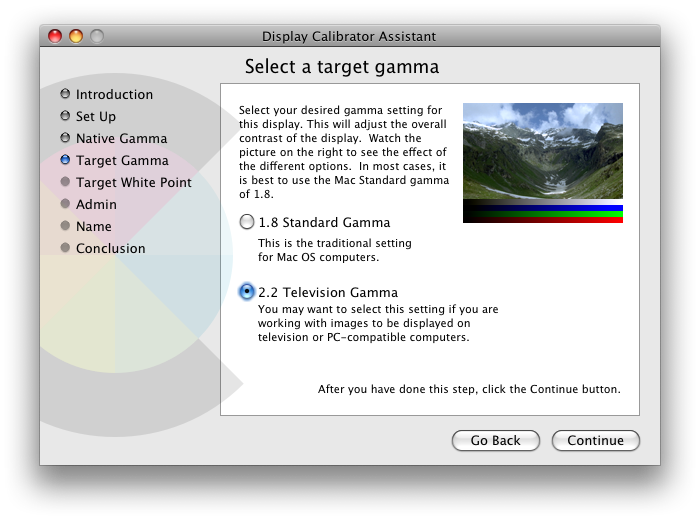 It’s most important to change the gamma setting, and calibrate the display in the process. How do you do this? By setting up a new color profile. This is fairly easy to do. 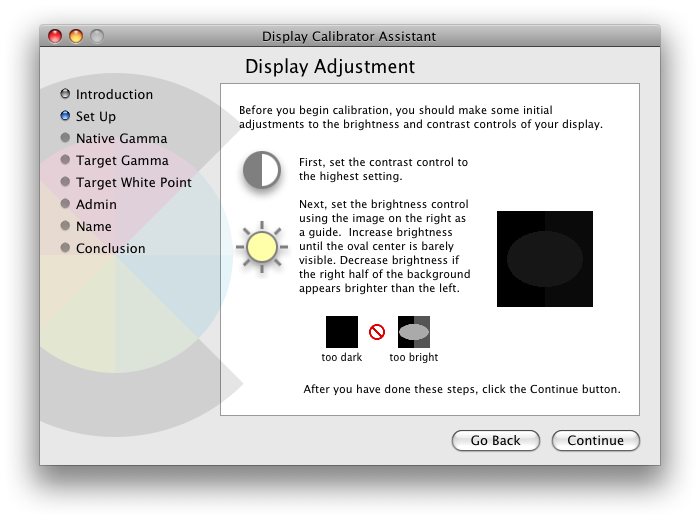 First of all, if you are using the “Shades” program (or any other program that gives you software control over display brightness or any other display parameter), go into the program or preference panel and turn it off before you begin this process, otherwise it may fight you at every step of the calibration process, turning an easy task into a really difficult one with less than satisfactory results. Then follow the instructions. BUT, before you change the setting of your display’s contrast (using the control on the display itself), make a note of the current setting. You will be changing it as part of the calibration process but once you are all finished, you may decide that you want to go back to that setting, or something reasonably close. The only problem is, Apple’s idea of “just seeing it” and yours might be a bit different. We wound up using a setting that was a bit more than where the oval was just barely perceptible, but still a bit less than where the two halves of the surrounding rectangle started to appear as different, and that seemed to work best. Originally we tried setting it where the oval was just barely perceptible, but then after the adjustments were completed we couldn’t get a monitor setting that we liked (everything was too dark for our liking, particularly on some of the wallpaper). We suspect that “D65″ and “Native” are very close on modern displays (perhaps even identical). You can try both and see which works best, or you can just go with the recommendation from the above-mentioned article to use D65. EDIT: The second time I attempted to do this, the display calibrator crashed before I could save the settings. If it happens to you, try this: In Finder navigate to Macintosh HD/System/Library/ColorSync/Calibrators/Display Calibrator.app and right-click on the application, then click on “Get Info”, and when the information panel is displayed, you should see a checkbox for “Open Using Rosetta.” Check that box, and the problem goes away (at least it did for me, and for the people who posted replies in this thread). When you are all through, you are likely to see color in places that only looked grey or washed out before. That is because Apple’s default color profile and gamma setting tends to wash out certain colors. But, unless you have just acquired your Mac, it will look strange to you, because it’s not what you’ve become used to. You may have to try adjusting the monitor’s brightness and contrast to get something you like. The interesting thing is that whites may seem “whiter” than before and that may throw you a bit, but it will also show how screwed up Apple’s default color profile is. Try it for at least a day or two before you decide you don’t like it. We found that by setting the monitor’s contrast back to the original setting (the one we told you to note in the previous paragraph) and then using the brightness to adjust the monitor for best picture yielded the best results, but your results may be different. 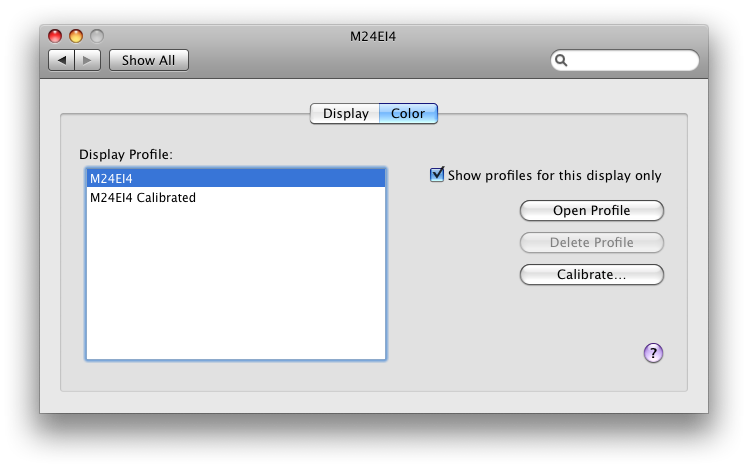 If you decide you really hate the calibrated profile, you can always go back to the default Mac color profile for your monitor, but then you can expect displays on other computers to look strange. Keep in mind that if you’ve gotten used to looking at washed out colors, it may take some time to adjust! This is an edited version of a post that originally appeared on a blog called The Michigan Telephone Blog, which in turn was reposted with the permission of the original author from a now-defunct Macintosh-oriented blog. It is reposted with his permission. Comments dated before the year 2013 were originally posted to The Michigan Telephone Blog. 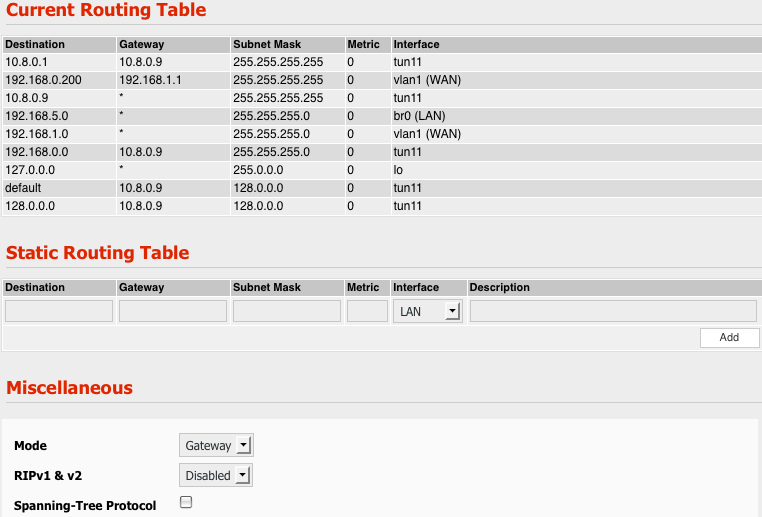 This article assumes that you are already able to ssh into a remote server using a password (that is, that your account has been created on the remote system and you are able to access it). Here’s how to set up ssh public/private key authentication so you don’t have to use the password on future logins, or so you can use Public Key authentication with MacFusion. First, open a terminal or iTerm window as we will be using it for most of the following operations. First, navigate to your home directory, and see if there is a folder called .ssh. Note that Finder will NOT show you this directory unless you have it set to show all file extensions, so since we are at a command line prompt anyway, it’s easiest to just type “cd ~” (without the quotes) to go to your home directory in Terminal or iTerm and type “ls -a” (again without the quotes – always omit the quotes when we quote a command) to see if the .ssh directory exists. If it does, go into the directory (”cd .ssh”) and see if there are two files called id_rsa and id_rsa.pub (use “ls -a” again). If either the directory or the files do not exist, you will need to create them. ssh-keygen -t rsa -f ~/.ssh/id_rsa -C "your@emailaddress.com"
Replace your@emailaddress.com with your email address – this is just to make sure the keys are unique, because by default it will use your_user_name@your_machine_name.local, which might come up with something too generic, like john@Mac.local. It’s unlikely that anyone else is using your e-mail address in a key. If this process fails with a “Permission denied” error, it might be because SELinux is enabled. To check that theory, see How to Disable SELinux, which will show you how to disable it temporarily (for testing) or permanently. 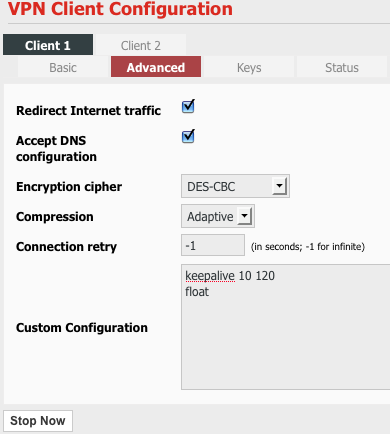 The above creates a new list of authorized keys on the remote system (overwriting any existing file with that name) and copies your public key to it. If you already have such a file and don’t want it overwritten, then you’ll have to manually add the contents of your local ~/.ssh/id_rsa.pub file to the end of the ~/.ssh/authorized_keys file on the remote system. 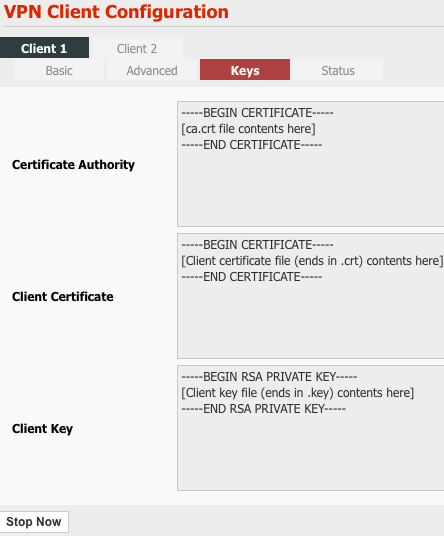 This fixes the permissions on the authorized_keys file on the remote system. Once again, there may be the odd situation where you can only run the command within the single quotes from the remote system. And change the “yes” to “no”. And change the “yes” to “no”. You’ll need to reboot or restart the ssh server for this to take effect. An alternate, and probably more secure fix is to check the permissions on your home directory – if it is not writable by anyone but the owner, then it should not be necessary to change the StrictModes parameter. For more troubleshooting hints see Debugging SSH public key authentication problems. 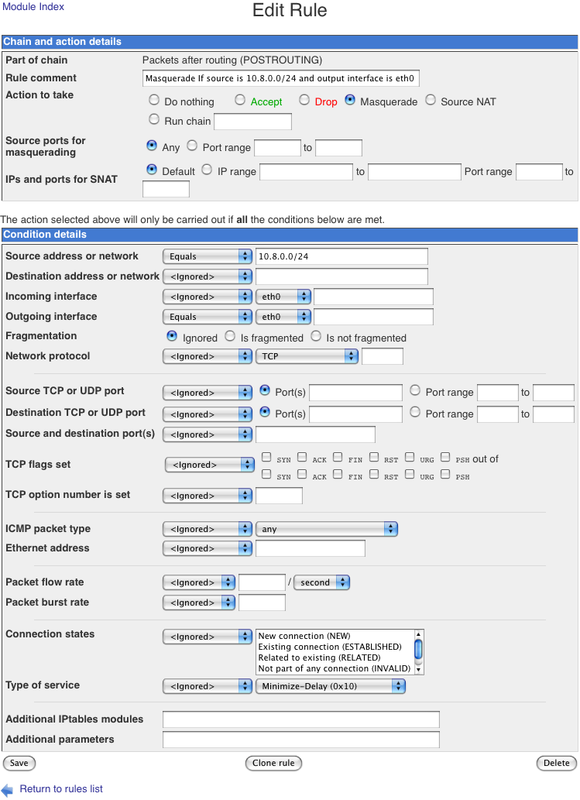 The above are very basic instructions for setting up ssh public/private key authentication. 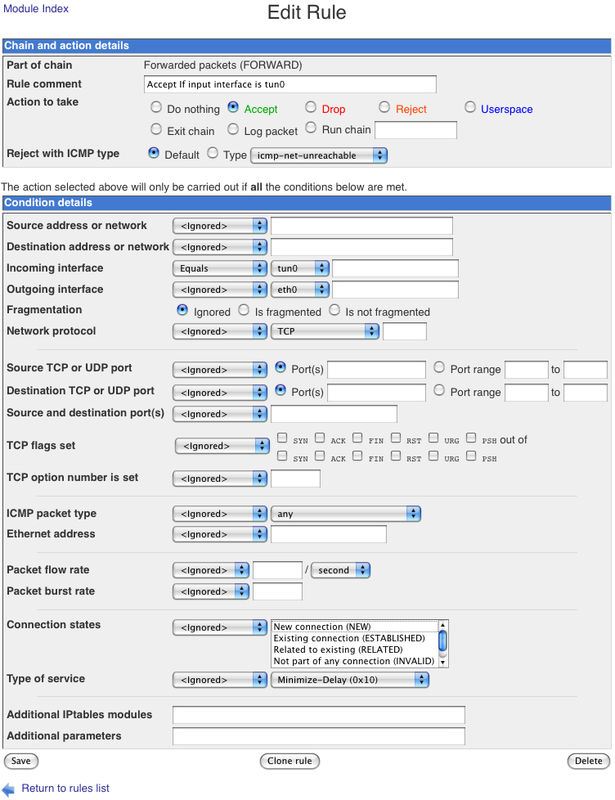 There are other ways to do this (including some that are arguably a bit more secure) but we wanted to keep it simple. 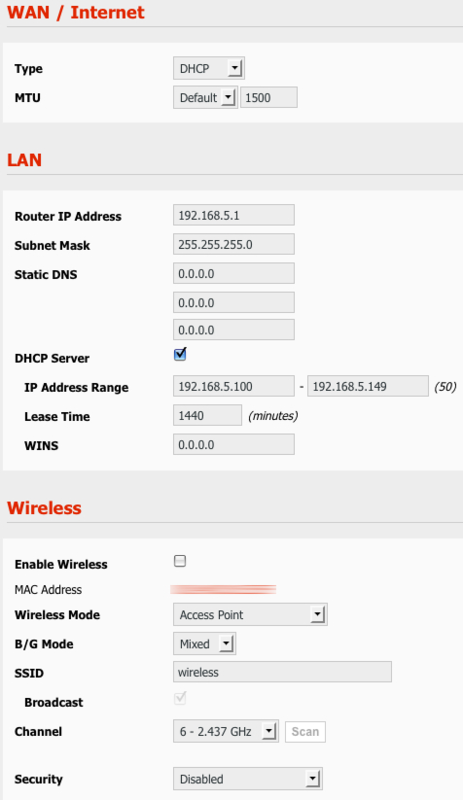 Hopefully this will help someone who is using ssh, MacFusion, etc. and wants something a bit more secure and less bothersome than password access. If it still stops working lower the timeout to 30. See How to fix ssh timeout problems for more information. If you find my instructions confusing, try SSH Passwordless Login Using SSH Keygen in 5 Easy Steps. And, for hints on making ssh more secure (particularly if you permit access from the Internet in general and not just your local network), see this article on Securing OpenSSH (via the CentOS wiki). EDIT: New article for Midnight Commander users: Fixing Midnight Commander’s unreadable dropdown menus. EDIT: This article has been revised to show the latest information as of 2012. Note that these instructions probably will not work unless you are running a relatively recent version of OS X. 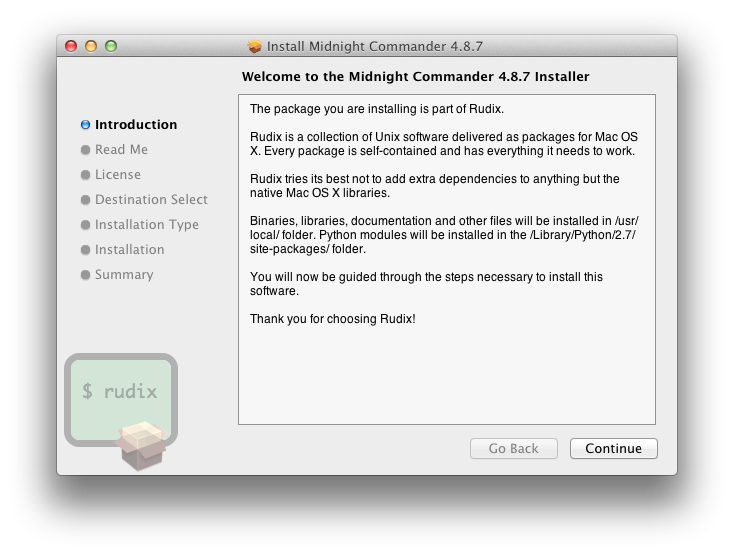 Also, you really should read How to install Midnight Commander under Mac OS X (the easiest way?) before using the procedure shown here! I have to admit, I am one of those people who dislikes Linux for one major reason: Whenever you ask for help in any online forum, the knowledgeable people all seem to be command-line devotees, and they invariably give you instructions that involve typing long, arcane commands into the command line. I hate using the command line – if I had wanted to use a command line, I’d never have moved away from MS-DOS, and i cannot understand why Linux geeks insist on using it, and on trying to get others to use it. Even users of Linux distributions such as Ubuntu have found that when they go online asking how to do some function that could easily be accomplished using one of the GUI tools, often some obnoxious twit helpful person will reply by giving a bunch of stuff (that makes no sense at all to the uninitiated) to type in at the command line. One of the things I like most about Mac OS X is that you almost never have to do anything from a terminal prompt if you don’t want to, and Mac users seem to have a healthy disdain for using a computer as if it were still the 1970’s. Long ago, when I was using MS-DOS, there was one tool that I had to have on any system I was using: Norton Commander. The original, dual-pane file manager that made it oh-so-easy to do typical file manipulations like copying and moving files, viewing and editing text files, launching executables, etc. without typing in DOS commands. Norton Commander was such a great program that it inspired similar programs on other platforms, such as Total Commander under Windows, and the cross-platform muCommander that runs on just about anything (if it has Java installed). In the Linux world, KDE users have Krusader, and Gnome users have Gnome Commander. Mac OS X users have a number of choices, including the aforementioned muCommander and Xfolders, both of which are free. Possibly the best alternative today is XtraFinder, which is excellent and free — it add tabs and other features to the OS X Finder, and can display dual panes in either a horizontal or vertical alignment. However, despite your best intentions, there may come a time when you find yourself working at a shell prompt. Maybe you are working with a Linux server, or on a Mac, maybe you can’t get OS X to come up but you are able to get to a terminal prompt (in my early days of using a Mac, this happened to me twice after OS X upgrades). More commonly, you are getting a permissions error on some file and can’t understand why – that’s very rare on the Mac, but it happens, and now you find yourself in the terminal trying to remember how to change permissions or ownership on a file (by the way, in most cases you should be doing this by right-clicking on the file in Finder, then clicking on “Get Info” in the context menu, and then using the Sharing & Permissions section at the bottom of the information panel. But there are occasions when nothing else seems to work, and you want to go a bit deeper into the guts of the system). It is at those times when Midnight Commander may be the tool you want. Rudix features a world class collection of pre-compiled and ready to use Unix compatible software which are not available from a fresh installation of Mac OS X but are popular among other Unix environments. Here you can find utilities, programming languages, libraries and tools delivered as standard Mac OS X packages. Now, I hear some of you “cut-my-teeth-on-Unix” types screaming, “What about MacPorts? What about the Fink project?” Those are all well and good if that’s your cup of tea, but they require a much higher lever of Unix “geekiness” to install, and they add a lot of code that the typical user doesn’t need. Rudix will let you add a whole bunch of Unix utilities if you really want to do that, but if you only want a few needed utilities then the “Custom Install” button in the Rudix installation lets you select exactly what you want, and no more. Click “Continue” and continue to do so until it has been installed. That’s all there is to it! I should point out that this used to be a much more convoluted process, and there was a much longer set of instructions here explaining it, but all those old instructions are superfluous now. 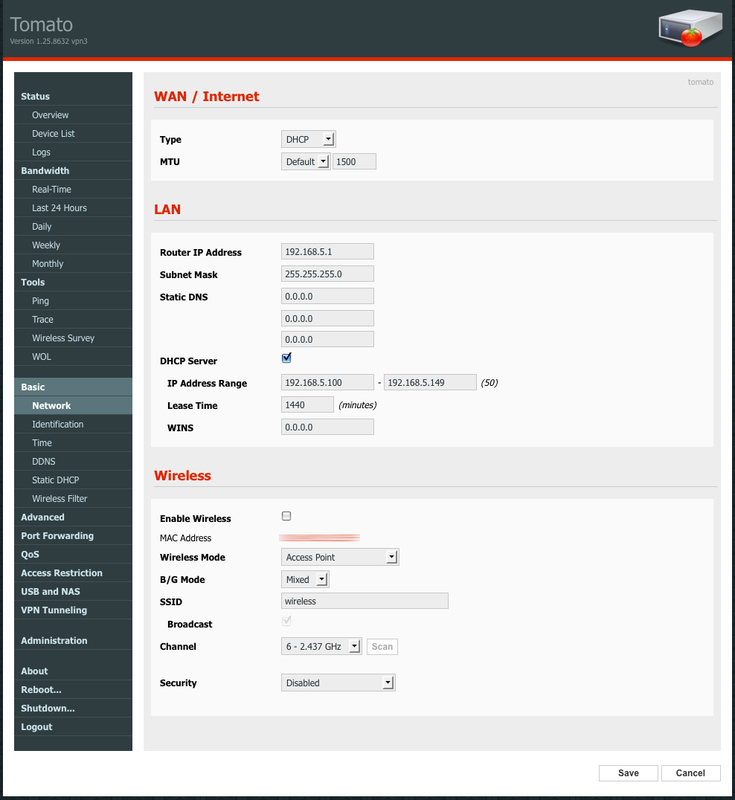 Once you have installed Midnight Commander, you will realize that you can easily install many other utilities commonly found on Unix/Linux systems, if they are available in the Rudix package list. Personally, I would not go hog wild on this – I’d only install the utilities you actually need, as you need them. One package I typically install is wget, because so many scripts (such as those written in Perl) expect it to be present. Edit March 28, 2008: I made an interesting discovery tonight. Normally I use iTerm as my terminal program, and Midnight Commander runs fine in that. What it does not seem to run so well under is the Terminal.app program that comes with OS X. What specifically does not work in Terminal.app, at least on my system, is the mouse. Under iTerm, mouse clicks get passed to Midnight Commander in the normal manner, but under Terminal.app that doesn’t seem to be the case. Another thing that you can do in iTerm (but not Terminal) is hold down the ﻿﻿﻿﻿﻿﻿⌘ (Command) key and right click on a file to select it. So, for the “best user experience”, so to speak, I’d suggest downloading and installing iTerm, which has a lot of other nice features you’ll probably appreciate (and did I mention it’s free?). And, the Midnight Commander manual is another good source of information on this subject. Command line haters of the world, untype!